Two Blue Lemons: Two Blue Lemons in Eating Well! Two Blue Lemons in Eating Well! Good morning! 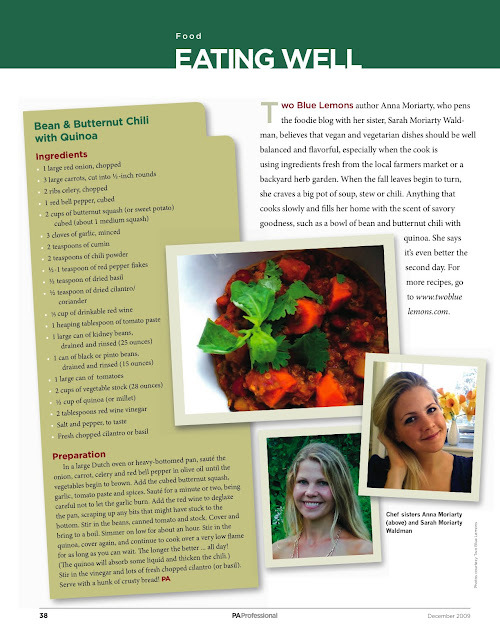 I just wanted to share with you all that Two Blue Lemons' Bean & Butternut Chili with Quinoa is being featured in the Eating Well section of the December issue of the American Academy of Physicians Assistants Professional Magazine. It's the first time Two Blue Lemons will appear in a printed publication, so we're pretty excited around here! Thank you to everyone who visits our little labor of love! Congratulations - I LOVE that chili recipe! Thank you, Ashley! We're so glad! Congratulations! That's really great to hear. I bet you two are really excited - nice pics too. Congrats to you, and what a worthy recipe! Wow, just over one year and you two have already made it to the big time! Hope to see more of where that came from. Congrats! Thank you so much for your lovely comment! What fun to hear that someone actually received a real copy in the mail! I'm so glad you enjoyed the recipe and that your husband liked it as well! It's been in the single digits in Cambridge this week so I could really go for a pot of warm chili! Thanks again for visiting the site and for your comment! Happy New Year and Happy Eating!! Came across this scruptious looking recipe as I was catching up reading last month's AAPA Professional magazine. This will be family dinner tomorrow (I'll cook it today, as you suggest) and tonight's meal will be the potato/artichoke tortilla. Lovely website. I hope you will be submitting more recipes to AAPA. I plan to print off several copies of the chili to inspire my patients to try delicious and healthful food alernatives. Thank You. Thanks so much for your lovely note! We're so glad you found us... welcome! If you do try any of the recipes we'd love to hear your thoughts. Thanks again for getting in touch with us. It sounds like you do wonderful work and care a great deal about and for your patients. Hoping your new year has been happy, healthy, and full of good food!